Since the introduction of the new consultant’s contract in 2003 the Trust had not seen much benefit from the new contract and the job planning process. 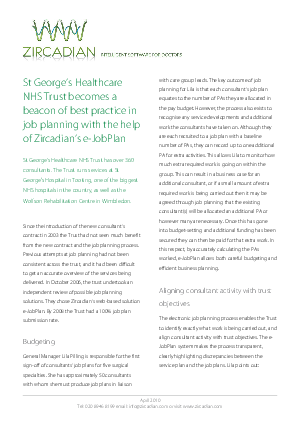 Previous attempts at job planning had not been consistent across the trust, and it had been difficult to get an accurate overview of the services being delivered. In October 2006, the trust undertook an independent review of possible job planning solutions. They chose Zircadian’s web-based solution e-JobPlan. By 2008 the Trust had a 100% job plan submission rate. General Manager Lila Pilling is responsible for the first sign-off of consultants’ job plans for five surgical specialties. She has approximately 50 consultants with whom she must produce job plans in liaison with care group leads. The key outcome of job planning for Lila is that each consultant’s job plan equates to the number of PAs they are allocated in the pay budget. However, the process also exists to recognise any service developments and additional work the consultants have taken on. Although they are each recruited to a job plan with a baseline number of PAs, they can record up to one additional PA for extra activities. This allows Lila to monitor how much extra required work is going on within the group. This can result in a business case for an additional consultant, or if a small amount of extra required work is being carried out then it may be agreed through job planning that the existing consultant(s) will be allocated an additional PA or however many are necessary. Once this has gone into budget-setting and additional funding has been secured they can then be paid for that extra work. In this respect, by accurately calculating the PAs worked, e-JobPlan allows both careful budgeting and efficient business planning.